Cairns Karaoke Where the Music's Pumping! Cairns karaoke fans; both locals and visitors can get their weekly fix of karaoke at several great karaoke venues around town. Come on down and join in! We'd love you to come down for a sing but if you prefer to just sit back, relax and watch the karaoke talent; that's fine too! And of course at karaoke gigs when the vibe is rocking and the music's pumping; there's usually plenty of dancing! If you don't dance; that's fine too. Just so long as you have an awesome time, just chilling'! Long time favorite hosts are well regarded within the local area with two regular gigs every week at Woree Tavern and Raintrees Tavern. Get on down and support your local karaoke hosts and venues in Cairns! 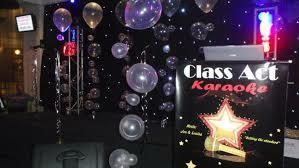 Class Act Karaoke offers a fab Sunday karaoke sesh every week in Vertigo's Lounge at the Reef Hotel Casino. There are regular monthly gigs (sometimes bi-monthly but do check) at Cairns RSL and also over at Innisfail RSL. Do check out the fab KANPAI Japanese Restaurant with— you guessed it: karaoke! Delicious sushi & Asian- Fusion cuisine complete with Karaoke rooms! Perfect!